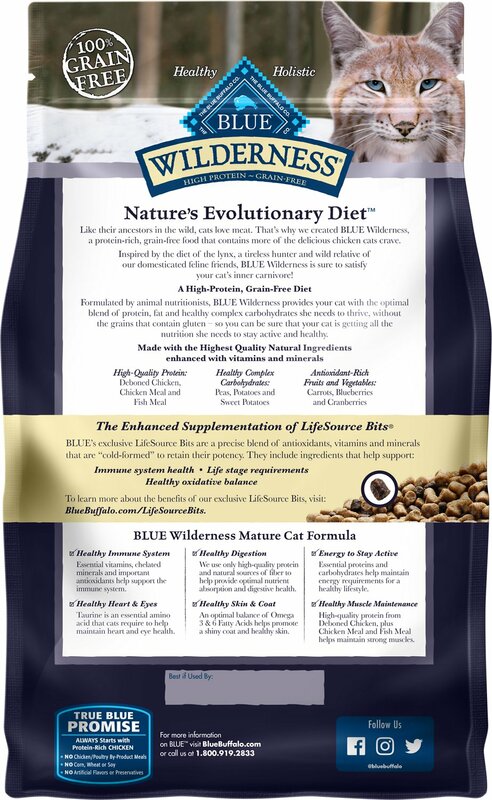 Feed your wise kitty’s wild side with the evolutionary nutrition of the Blue Buffalo Wilderness Mature Chicken Recipe Grain-Free Dry Cat Food. 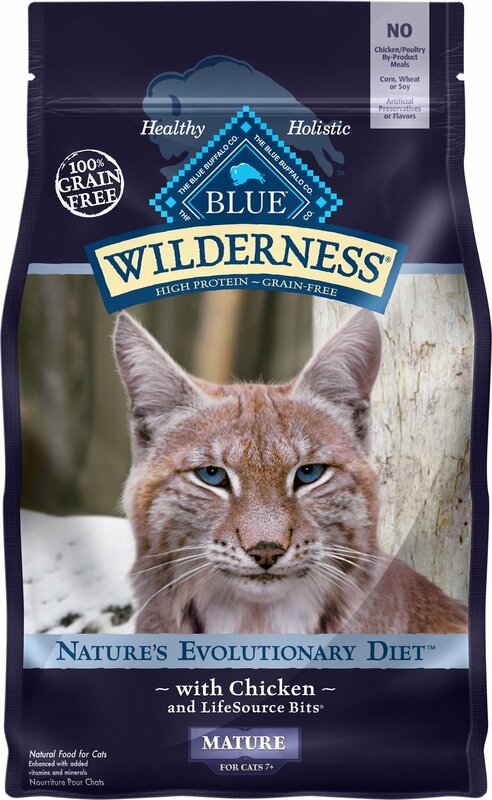 Made with real chicken as the first ingredient and never any grains, gluten, wheat or by-products, it packs a powerful protein punch to support your little hunter’s wild pursuits in every bowl. 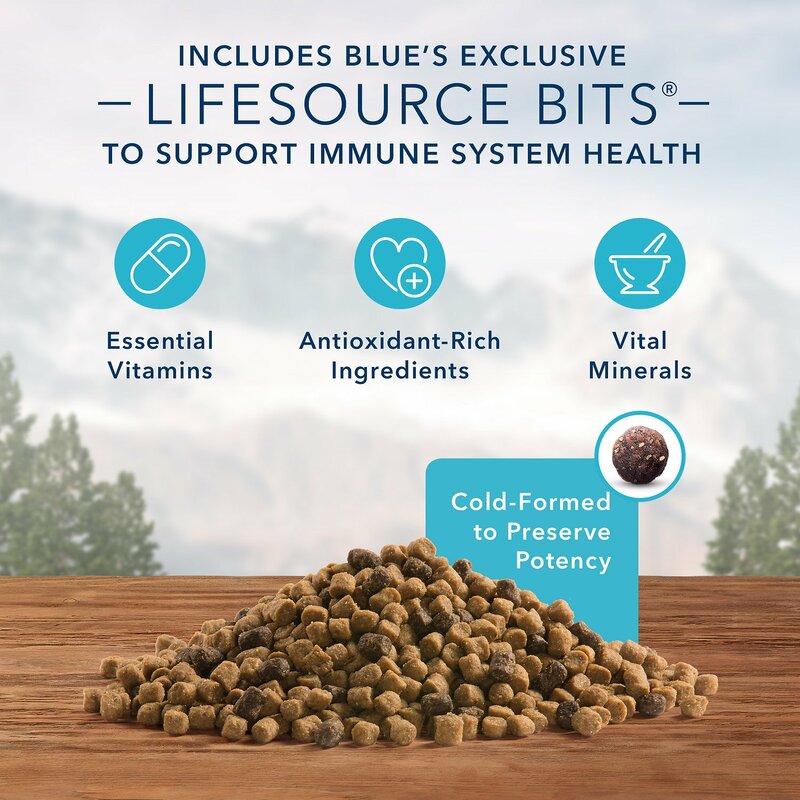 It’s loaded with antioxidant-rich LifeSource Bits―a unique blend of vitamins, minerals and superfoods to support immunity―plus omegas for a healthy skin and coat, taurine for vision and heart health, and essential amino acids to fuel all those indoor adventures. 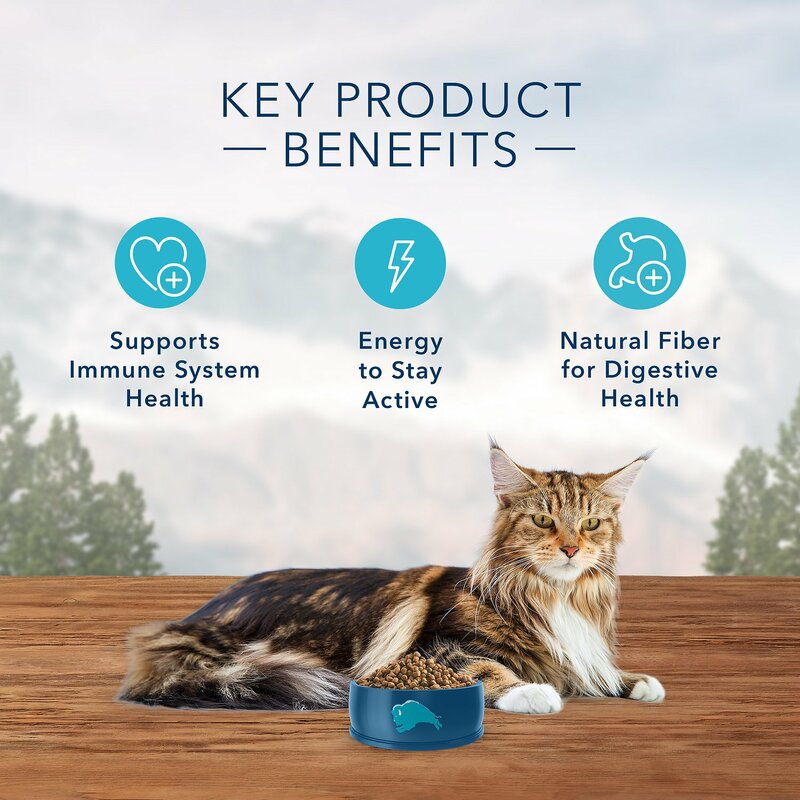 Plus, it helps maintain healthy digestion and happy tummies with a unique fiber blend in every bite. 100% grain-free senior recipe features high-protein chicken as the first ingredient to help maintain strong muscles and energy. Supports healthy digestion with natural fiber and probiotics blend, and helps maintain an ideal weight with balanced calories from proteins and fats. Healthy Digestion: High-quality protein and natural sources of fiber help provide optimal nutrient absorption and digestive health. We have two kitties, both 11 years old. I mixed it half and half with their old food and they eat half the food. Gave them scoops of just the Mature food and they walked away! They would not eat it! Went to the local pet store and got their old food. Wilderness Chicken hairball control, it's what they eat. Can't teach an old cat a new flavor! 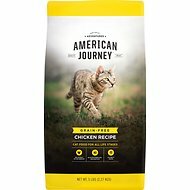 My two cats are a little older now and I was looking for something that would fill the need for their older diet and the grain-free chicken was exactly what they needed! They love it and they're able to digest it with no problems. I have a young female tuxedo named Sairey Gamp. She is a fan of dry food only. From birth she was on one particular dry food. Then my other characters began having urinary issues. Everyone was switched to Royal Canine SO. Sairey began losing weight. After diagnostic testing I put her on Blue. Not only does she love it, but her weight has stabilized. I couldn't be happier. I had already been getting it somewhere else,so I knew I approved of it and my cats liked it. Getting it delivered to my door for less money was a no-brainer! My oldest cat love his new food. He is getting older so he needed a different diet. So he tried this food and enjoys it a lot. My cats love this - they will go for the Chicken or the Duck so I have to keep it in stock at home. Not one of my 3 cats would eat this. They left it untouched for 2 days! This food may be 100% ok but my 2 adult cats would not touch this OR the Rachel Ray chicken Nutrish AT ALL. They have always gobbled down all other dry food happily but literally starved themselves for 4 days before I came home and gave them their old food. I have been gone that long before with no issues so really do not understand this issue. Very healthy for older cat and they love it! I have 4 older cats that I love like they were my sons. This is the best cat food that I have found. Thank you Chewy you are awesome.